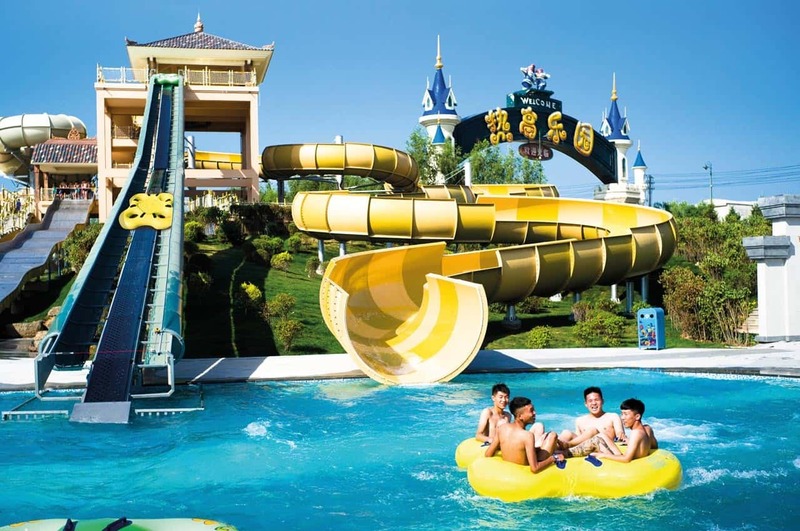 With more than 3,500 installations of its outdoor conveyor belt around the world, Sunkid is a reliable and experienced partner for the water park industry too. With the well-known chain technology, and two types of conveyor belts with endless belt technologies, Sunkid has the optimal transport solution of rafts, boats, canoes, and even people without vehicles. This conveyor is used where rafts of all sizes need to be returned from the landing pool to the start of the slide tower. For particularly steep gradients of up to approx. 50%, Sunkid has a unique solution in its innovative Blue-Eye surface. The Blue-Eye conveyor belt with its specially shaped, soft lamellas of a special rubber mix, ensure perfect carrying properties for the tubes right from the pool; while the water remains in the pool. In order to overcome large gradients of up to 90°, Sunkid offers the space-saving solution of a vertical conveyor belt. This chain conveyor belt with carriers is supplied by a belt conveyor in the lower area, so that the rafts can be transported precisely, cycled by the carriers. 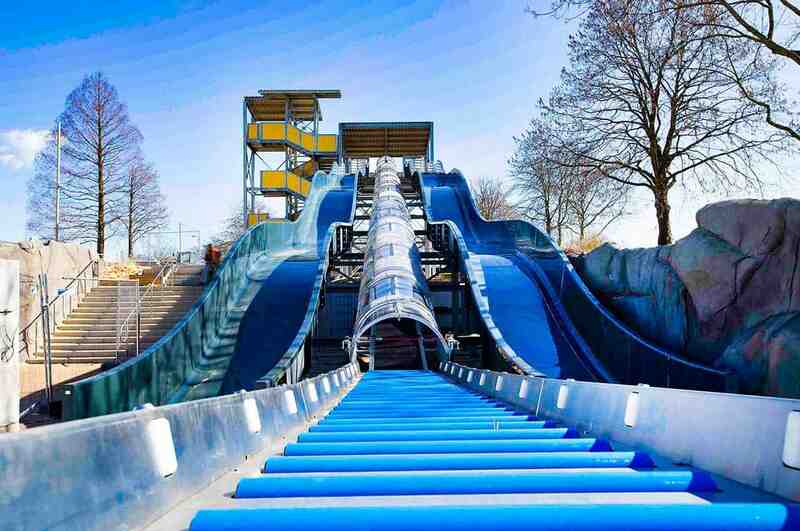 As for all conveyor belts in water parks, demand-controlled transport takes place here as well: if the raft is not removed at the slide tower, transport is interrupted and will only be started again when the space in the removal area is sufficient. The capability of Sunkid to engineer and build controls in-house enables to tailor the systems to the customers’ spefic needs. At e.g. 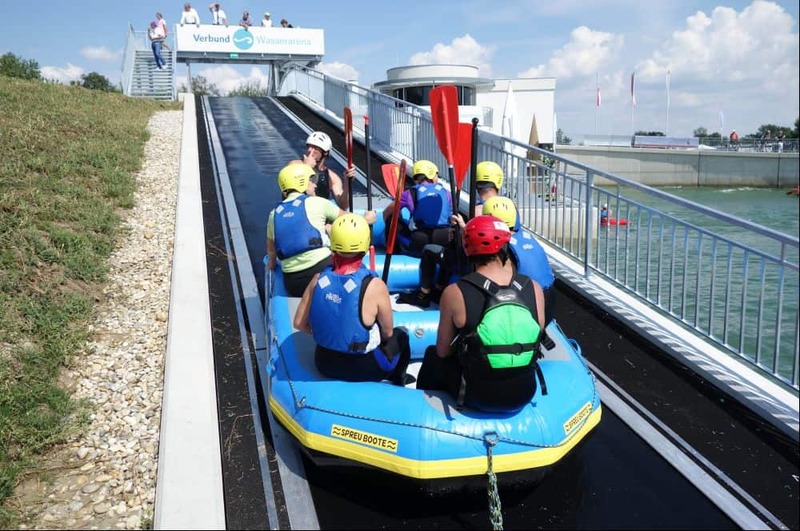 ENNI outdoor public pool (Moers/GER) Sunkid not only provided the conveyor belt system for rafts, but also the people guiding and access system. The turnstile at the start of the tube slide is automatically released when the previous user has left the exit area at the bottom, through a subsequent turnstile. Additionally, Sunkid supplied the entire electrical control (PLC) developed in-house, including: control cabinet with graphical user interface (GUI), traffic lights, cameras, and a screen for monitoring the activity.